The area of Guatemala City was the location of Kaminaljuyu, a Mayan civilization dating back to 1100 B.C.E. 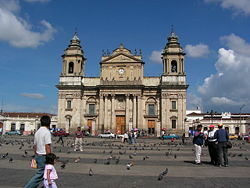 The modern city was founded as the capital of the captaincy general of Guatemala in 1776, replacing Antigua Guatemala. Three years previous it was destroyed by an earthquake. Following Guatemala's independence from Spain in 1821, Guatemala City served successively as the capital of the province of Central America under the Mexican Empire of Agustín de Iturbide (1822–23), the Central American Federation (1823–33), and then became the capital of the independent Republic of Guatemala. Guatemala City was largely rebuilt after a series of disastrous earthquakes in 1917 and 1918, which shook the city for six weeks. 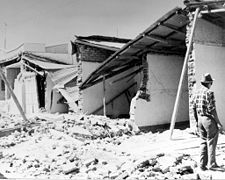 The most destructive earthquake came in 1976, resulting in more than 23,000 fatalities and 76,000 injured. Central America was engulfed in power struggles throughout the twentieth century. Guatemala was plunged into a civil war in 1960 that lasted 36 years, the longest in Latin American history. Although the nation has enjoyed relative stability since 1996, the effects of its history over its preceding decades delayed its development. 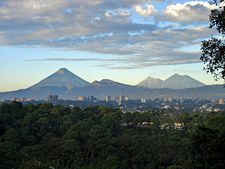 View of Guatemala City with the Agua, Fuego and Acatenango volcanoes in the background. The origin of the name Guatemala is Indian, but its derivation and meaning are undetermined. Some hold that the name means "land of the trees" in the Maya-Toltec language. Guatemala City is located in a valley of the central highlands in the south central part of Guatemala at an elevation of 4,897 feet (1,493 meters) above sea level. The city has a temperate and invigorating mountain climate. The average maximum daytime temperature year-round is 86°F (30°C). Rainfall in Guatemala city varies from two inches to 57 inches a month (51 mm to 1455 mm). Four volcanoes are visible from the city; two of them are active. The nearest and most active is Pacaya, which at times expels a considerable amount of ash, resulting in the closure of La Aurora International Airport and subsequent flight delays. Due to heavy rainfalls, some of the humble neighborhoods built at the edge of steep valleys are frequently washed away and buried under mudslides, as occurred in October 2005. Guatemala City is subdivided into 25 zones, each zone with its own streets and avenues. The city has grown quickly, absorbing the neighboring towns of Villa Nueva, Santa Catarina Pinula, Mixco, and the suburban area of Carretera a El Salvador, which is a big commercial and residential part of the city. Zone One is the historic center, and is the location of the Palacio Nacional (National Palace), the Metropolitan Cathedral, the National Congress, the National Library, and Central Park. 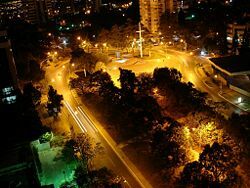 Zone Ten or the Zona Viva, along with being the financial district, is where most of the embassies, hotels, restaurants, bars, discotheques, and other entertainment places in the city are located. Kaminaljuyu and other Preclassic sites in Guatemala. Monument from the Kaminaljuyu archeological site, a Pre-Columbian site of the Maya civilization. The known parts of Kaminaljuyu lie on a broad plain beneath roughly the western third of modern Guatemala City. Large scale destruction of adobe houses in Guatemala City, following the earthquake of February 4, 1976. 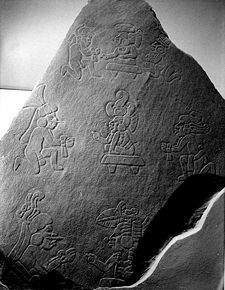 The first proof of human settlers in Guatemala dates back to 10,000 B.C.E., although there is some evidence that puts this date at 18,000 B.C.E., such as obsidian arrowheads found in various parts of the country. The Maya civilization dominated the region for nearly 2,000 years before the Spanish arrived in the early sixteenth century. Kaminaljuyu, a site of the Maya civilization dating back to 1100 B.C.E., was located in the area that became Guatemala City. The Mayan states of the central highlands, however, were still flourishing until the arrival of the Spanish Conquistador Pedro de Alvarado (1485-1541), who subjugated the native states, beginning in 1523. In Spanish colonial times, Guatemala City was a small town, with a monastery called "El Carmen," founded in 1629. The capital of Spanish colonial Central America was moved there on January 2, 1776, after several earthquakes destroyed the old capital, Antigua Guatemala, in 1773-1774. This region was not as rich in gold and silver as Mexico or Peru, and was therefore not considered as important. Its main products were sugarcane, cocoa, blue añil dye, red dye from cochineal insects, and precious woods used in artwork for churches and palaces in Spain. On September 15, 1821, the Captaincy-general of Guatemala (formed by Chiapas, Guatemala, El Salvador, Nicaragua, Costa Rica, and Honduras) officially proclaimed its independence from Spain and its incorporation into the Mexican Empire. The city was the scene of the declaration. The Captaincy-general of Guatemala was dissolved two years later. 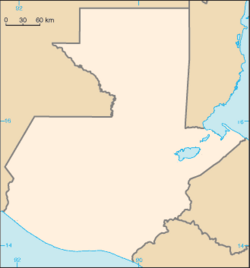 The Guatemalan provinces formed the United Provinces of Central America, also called the Central American Federation (Federacion de Estados Centroamericanos). 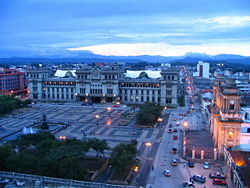 Guatemala City served as the capital. That federation dissolved in civil war which lasted from 1838 to 1840. José Rafael Carrera Turcios (1814-1865) was the first President of Guatemala, representing the Conservatives, on two occasions: From December 4, 1844, to August 16, 1848, and from November 6, 1851, to April 14, 1865. Guatemala's "Liberal Revolution" came in 1871 under the leadership of Justo Rufino Barrios (1835–1885), who worked to modernize the country, improve trade, and introduce new crops and manufacturing. During this era coffee became an important crop for Guatemala. The U.S.-based multinational United Fruit Company started becoming a major force in Guatemala in 1901, during the long presidencies of Manuel José Estrada Cabrera (1857–1923) and General Jorge Ubico (1878–14 June 1946). During the latter's dictatorship in the 1930s, Guatemala was further opened up to foreign investment, with special favors being made from Ubico to the United Fruit Company in particular. The company responded by pouring investment capital into the country, buying controlling shares of the railroad, electric utility, and telegraph, while also winning control of over 40 percent of the country's best land and de facto control over its only port. Guatemala City has been rocked by earthquakes, the worst from 1917 to 1918, which shook the city for six weeks. The most destructive earthquake was the 1976 quake with a magnitude of 7.5 Mw and an epicenter depth of just 3.1 miles (five kilometers) near Guatemala City. This shallow earthquake caused 23,000 fatalities, leaving 76,000 injured and causing widespread material damage. A 7.9 Mw earthquake of 1942—though higher in magnitude—was much less destructive, in part because of its substantially larger epicenter depth of 37.2 miles (60km). During the second half of the twentieth century, Guatemala experienced a variety of military and civilian governments, as well as a 36-year guerrilla war. In 1996, the government signed a peace agreement formally ending the conflict, which had left more than 100,000 people dead and had created, by some estimates, some one million refugees. A view of the National Palace from the Parque Central in Guatemala City. Monument to Pope John Paul II. Guatemala is a constitutional democratic republic, in which the president is both the chief of state and head of government, who is elected by popular vote for a four-year term, and may not serve consecutive terms. The unicameral Congress of the Republic has 158 members who are elected by popular vote to serve four-year terms. The president appoints a council of ministers. Guatemala is divided into 22 departments (departamentos) and sub-divided into about 332 municipalities (municipios). 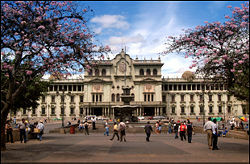 Guatemala City is the capital city of, and a municipality within, the Guatemala Department. Guatemala is the most populous of the Central American countries with a GDP per capita ($5100 in 2007) roughly one-half that of Argentina, Brazil, and Chile. The agricultural sector accounts for about one-tenth of GDP, two-fifths of exports, and half of the labor force. Coffee, sugar, and bananas are the main products, with sugar exports benefiting from increased global demand for ethanol. The 1996 signing of peace accords, which ended 36 years of civil war, removed a major obstacle to foreign investment, and Guatemala since then has pursued important reforms and macroeconomic stabilization. The distribution of income remains highly unequal with about 56 percent of Guatemala's population below the poverty line. Other challenges include increasing government revenues, negotiating further help from international donors, upgrading government and private financial operations, curtailing drug trafficking and rampant crime, and narrowing the trade deficit. Guatemala's large expatriate community in the United States provides inflows of cash serving as a primary source of foreign income equivalent to nearly two-thirds of exports. Guatemala is heavily centralized. 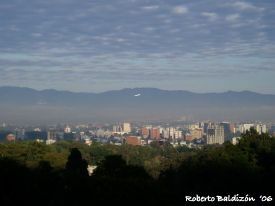 Transportation, communications, business, politics, and the most relevant urban activity take place in Guatemala City. There is only one highway that traverses the greater communities of the country. Some coastal towns are accessible only through the coast by boats. The newly renovated and expanded La Aurora International Airport lies in the southern part of the city and is the main gateway to the country. Urban public transportation is provided solely by bus. A project called Transmetro, consisting of special-purpose lanes for high-capacity buses, began operating in 2007 and aims to improve traffic flow. Guatemala City had a population of 1,202,536 in 2006, although it has grown rapidly in the two years to 2008. There were about 7,156,000 in the greater metropolitan region. Guatemala City's population continues to increase with the influx of predominantly indigenous migrants from the other departments as well as people from other countries. Guatemalans have diverse origins, with Mestizo (mixed Amerindian-Spanish) and European descent being the most common at 59.4 percent. There are also important indigenous communities and smaller German, Jewish, and Korean communities. Sixty percent of Guatemalans speak Spanish, while 40 percent speak Amerindian languages. Religious adherents include Roman Catholics, Protestants, and followers of indigenous Mayan beliefs. The University of San Carlos of Guatemala, in Guatemala City, the third oldest university in America, was declared a university on January 31, 1676, by royal command of King Charles II of Spain. It had previously been known as the School of Saint Thomas (Escuela de Santo Tomás), founded in 1562 by the priest Francisco Marroquín. The nine other universities in the city are Universidad Mariano Gálvez, Universidad Panamericana, Universidad Mesoamericana, Universidad Rafael Landivar, Universidad Francisco Marroquin, Universidad del Valle de Guatemala, Universidad del Istmo, Universidad Galileo, and Universidad Rural. Guatemala City is the location of the ancient Maya city of Kaminaljuyu, which dates back some 9,000 years. The center of Kaminaljuyu was located a short distance from the oldest part of Guatemala City. When first mapped from the 1930s, it comprised some 200 platforms and pyramidal mounds, at least half of which were created before 250 C.E. However, in the late twentieth century, the city grew around the ruins, and many of the several hundred temple mounds have been built over with freeways, shopping centers, commerce, luxury hotels and residential areas, leaving only a few mounds. The central ceremonial center of Kaminaljuyu was protected by the Guatemalan government and remains a park within the city. The National Palace, which is is identified as Guatemala City's symbol in its monumental architectural context, was the most important building in nation and was the headquarters of the President of Guatemala. The building is the origination point of all the roads in the Republic, and has a spot known as Kilometro Cero (Zero Kilometer). The building is used as a museum. Guatemala City possesses several sportsgrounds and is home to many sports clubs. Football is the most popular sport, with Comunicaciones, CSD Municipal, and Aurora FC being the main clubs. 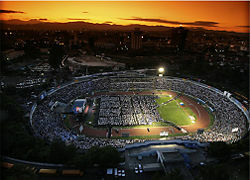 The Estadio Mateo Flores, located in the Zone 5 of the city, is the largest stadium in the country, followed in capacity by the Estadio Cementos Progreso and the Estadio del Ejército. An important multi-functional hall is the Domo Polideportivo de la CDAG. Political stability since 1996 has brought economic growth, and Guatemala City remains the location of most of the nation's economic activity. With about 56 percent of Guatemala's population below the poverty line, Guatemala City faces challenges of drug trafficking and rampant crime. Despite being the location of an ancient Maya settlement, and despite the presence of numerous Mayan remnants throughout the nation, Guatemala City has demolished ancient sites, and thus missed out on on a potential goldmine of international visitors. ↑ Juan Carlos Llorca, October 7, 2005, Mudslide in Guatemala kills dozens. San Diego Union-Tribune. Retrieved November 29, 2008. ↑ Mary Esquivel de Villalobos, Ancient Guatemala, Authentic Maya. Retrieved July 24, 2007. ↑ U.S. Geological Survey, Historic Earthquakes: Guatemala: 1976 February 04 09:01 UTC: Magnitude 7.5. Retrieved November 29, 2008. ↑ Cecilia Tortajada, Water Management for Large Cities (London: Routledge, ISBN 041541363X). Jimenez, M. F. 1995. "Levenson-Etrada: Trade Unionists Against Terror: Guatemala City, 1954-1985." NATION-NEW YORK-260 (5): 172. ISSN 0027-8378. Johnston, Francis E., and Setha M. Low. 1995. Children of the Urban Poor: The Sociocultural Environment of Growth, Development, and Malnutrition in Guatemala City. Boulder, CO: Westview Press. ISBN 9780813386331. Offit, Thomas A. 2008. Conquistadores de la calle: Child Street Labor in Guatemala City. Austin: University of Texas Press. ISBN 9780292718470. Pan American Union. 1949. Guatemala City. OCLC 1877284. World Fact Book. 2008. Guatemala. Retrieved November 23, 2008. This page was last modified on 5 August 2016, at 16:49.